1) Carbon dioxide removal techniques (CDR) would address the root cause of climate change by removing greenhouse gases from the atmosphere. They are the base of 'negative emissions'. 2) Solar Radiation Management techniques (SRM) would attempt to offset effects of increased greenhouse gas concentrations by reducing the amount of sunlight absorbed by the earth. Effectiveness and side effects of the proposed techniques are still largely uncertain. Therefore, our research focuses on a better understanding of effectiveness and risks of SRM techniques, and on the resulting artificial climate. We did model studies on the climate impact of mirrors in space and sea salt injections over the ocean for marine cloud brightening (Niemeier et al, 2013). Our main interest is the evolution and distribution of stratospheric sulfate from artificial injections and volcanic eruptions, somehow the natural base of the sulfur injection method. A focus of our research can be summarized in the question 'Can injections of sulfur into the stratosphere help to counteract climate change?' (Niemeier and Tilmes, 2017). This Science Perspective article (summary) provides an overview of current knowledge of side effects and related governance issues. 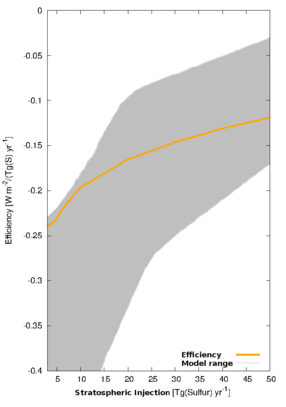 SAM techniques are presently not developed and knowledge of impacts is based on numerical model studies only. Major results of our research are related to the effectiveness of sulfur injections into the stratosphere (Niemeier et al., 2012). Stratospheric sulfate aerosols scatter solar radiation, causing a surface cooling, and absorb terrestrial and near infrared radiations, causing heating of the aerosol layer. It has become clear that the cooling efficiency, the cooling per injected unit of emitted sulfur mass, decreases with increasing injection rate (Niemeier and Timmreck, 2015). Thus, the more SAM is done, the less effective further injections are at reducing temperatures. The impact of the sulfate heating in the stratosphere intensifies this effect by influencing dynamics and increases the tropical confinement of the aerosols. This feeds back on the distribution of sulfate aerosols over the globe (Niemeier and Schmidt, 2017). Comparing this efficiency to the results of other models, we see a wide range of results (Fig. 1). Efficiency decreases in all models but the forcing, or resulting surface cooling, gained by a certain injection, differs clearly. Therefore, the amount of cooling one would gain from a certain injection remains uncertain. To overcome this problem, more model studies with clearly defined setup are necessary. Also necessary are further investigations in model development, e.g. coupling to chemistry, ocean and land processes. A robust pattern of climate responses to SRM is the slowing of the hydrological cycle. An engineered climate would be different to a natural climate, especially with reduced global mean precipitation (Schmidt et al., 2012). However, the specifics of the response of the global hydrological cycle to SRM depend on the technique (Niemeier et al., 2013). Our numerical climate model studies are often performed in the framework of model intercomparison projects. We have coordinated EU FP7 project IMPLICC, where several European groups performed a coordinated set of numerical experiments, and are participating in the Geoengineering Model Intercomparison project (GeoMIP). We have been involved in the European Transdisciplinary Assessment of Climate Engineering (EUTRACE), and are participating in two projects of the priority program 'Climate engineering: Risk, challenges and opportunities' of the German Science Foundation (DFG). Niemeier, U., Schmidt, H., Alterskjaer, K., & Kristjánsson, J. E., Solar irradiance reduction via climate engineering: Impact of different techniques on the energy balance and the hydrological cycle. Journal of Geophysical Research-Atmospheres, 118, 11905-11917, (selected as AGU spotlight), 2013. Niemeier, U., Schmidt, H., & Timmreck, C., The dependency of geoengineered sulfate aerosol on the emission strategy. Atmospheric Science Letters, 12, 189-194, https://doi.org/10.1002/asl.304, 2011. Schmidt, H., Alterskjaer, K., Bou Karam, D., Boucher, O., Jones, A., Kristjansson, J. E., Niemeier, U., Schulz, M., Aaheim, A., Benduhn, F., Lawrence, M., & Timmreck, C., Solar irradiance reduction to counteract radiative forcing from a quadrupling of CO2: climate responses simulated by four earth system models. Earth System Dynamics, 3, (see EGU press release), 63-78, 2012. Further publications can be found on the GeoMIP web page.